WL Sponsored: Wings of Hope’s Healing Hands Friends gather to remember a friend and support Melanoma research at the Wings of Hope Gala. 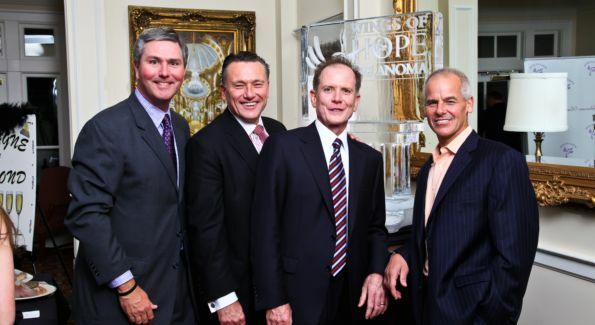 Guests Bud Wilkinson, Chad MacDonald, Bill Reilly and Mike Esposito at the Wings of Hope Gala at the Trump Golf Club. Image courtesy of Tony Powell. Friends gather to remember a friend and support Melanoma research at the Wings of Hope Gala. When Chad MacDonald lost his wife Brenda five years ago to Melanoma, he and his three sons rallied the support of their Great Falls community to begin trying to make a difference in Brenda’s memory. What started in a barnyard, literally, with a Halloween costume party with finger food and kegs has evolved into the Brenda Macdonald Melanoma Research Foundation and the Annual Wings of Hope Gala, now in its second year. This year’s gala was even bigger than the first, with 400 attendees and 50 corporate sponsors who chipped in $200,000 to help make a difference. BRENDA’S FRIENDS: Bill and Jackie Reilly, Chad and Natalie MacDonald, David and Lorin Keuhner, Lisanne Morales, Mike and Wendy Lincoln, Joe and Ruthie Robinson, Paul and Lisa Brown, Robert and Juliana Miller, Steve Wiltse, James and Heather McQuaig, Ed and Sharri Dean. Photo by Tony Powell. Rachel Stottlemyer, Kate and Quinn Wilkinson, Lauren Antilety. Wings of Hope Gala. Trump Golf Club. November 6, 2010.